X-Factor supremo Simon Cowell is fuming. Viewing figures for the prime-time show are down significantly compared with last year. But I suspect after making his views known via the front page of The Sun, the number of people watching will be back up this weekend. Millions of people who previously couldn’t care less will tune-in tomorrow night to see what drama has been added to boost things. But just how did the enterprising Mr Cowell achieve that likelihood? Did he spend some of his millions advertising the show? Did he take out an endless array of pay per click adverts? Did he have to improve the “search engine optimisation” of the show website? No. All he did was make a phone call to the TV Editor of The Sun. OK, I admit, it did cost Simon Cowell an international phone call as he is based in the USA at the moment, starring on the American X-Factor, but in terms of costs a phone call is effectively free compared with the price of advertising. It is an example of the power of public relations – PR. And Mr Cowell is not the only one to understand this. Take young Mark Zuckerberg, the founder of Facebook, for instance. Just how did he get students at Harvard to become interested in his fledgling social network? He did an interview with the campus newspaper. It worked and when the network was added to Stanford one of his first tasks was to ensure he was interviewed by the student newspaper there. When Facebook was launched at Stanford it was swamped as a result. Nowadays, you can’t find a popular magazine or newspaper in the world that hasn’t included Mark Zuckerberg somehow. Very little cost and hundreds of millions of visitors. Meanwhile, over at Twitter headquarters, the executives there have a problem; they don’t have much money. True they have investment from venture capital firms and a small amount of advertising income, but compared with Facebook they are poor. And Facebook is a pauper compared with Google. Yet, up against these traffic titans, Twitter has to do something to get visitors – yet it cannot really afford the level of advertising it might need to generate that interest. But it doesn’t need to bother. Free of charge, Twitter has become the most talked about Internet brand name on TV. Every show, it seems, has Twitter on it. Thirteen years ago, it was Google in the same position. The two students who invented it couldn’t afford any real marketing, so all they could do to let people know about their new-fangled search engine was to get interviewed by journalists. Google, like Twitter is now “everywhere” – mostly via free publicity. Yet, businesses struggling to get visitors to their websites are spending their hard earned cash on pay per click or search engine optimization only to find that the effect is largely minimal. They focus on the data. The numbers of visitors achieved by pay per click or by SEO are easy to see. Get yourself on the news and discovering who visited you for what reason is more complex. Hence people avoid it. Plus businesses have little experience with journalists and tend to be scared of the media – another reason for keeping away from it. But if you look at Google Trends you’ll discover that there is a relationship between media coverage and visitors to your website. Every time the words “crime map” were in the news, up shot the search volume for that phrase. In other words it is OFFLINE activity which tends to drive online search. That means you need to generate lots of offline interest and mentions of your website if you want to gain more online traffic. 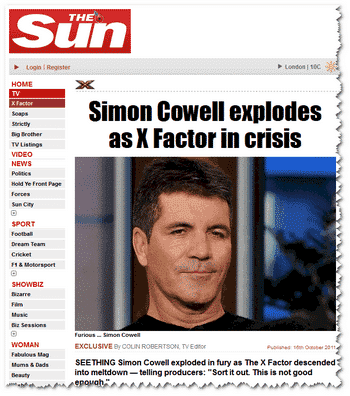 Take a tip from Simon Cowel – get yourself in the news, perhaps even on the front page of The Sun…. !